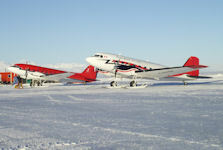 Basler Turbo Conversions takes the legendary DC-3 and puts it through an extensive remanufacturing process. Basler installs Pratt & Whitney Canada PT6A-67R turboprop engines and Hartzell five-blade metal propellers in place of the piston engines and props that powered the original aircraft. The conversion is actually a remanufacturing process. The whole process takes roughly 6 months and requires 35,000 to 45,000 man hours to complete, depending on configuration. 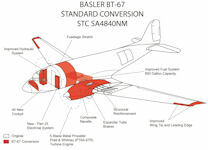 Basler Turbo Conversions, LLC believe that there are more than 500 good candidate airframes in existence. The end product is an essentially new aircraft with its gross take-off weight increased to 28,750 and an unbeatable combination of simplicity, reliability, and operating performance. The fly-away price is about $4 million. Mark Huber noted "The aircraft's notoriously temperamental 14-cylinder piston radial engines have always been seen as its weakest feature, so hanging turbines on DC-3s is not a new idea. The British tried it at the end of the 1940s using Armstrong-Siddeley Mamba and Rolls-Royce Dart turboprop engines. The engines helped, but the unpressurized aircraft couldn't be flown at an altitude that would use the engines to their best advantage, and the project was quickly dropped. The idea was resurrected in the 1960s: In California, a few "Super Turbo Threes" were made and sold, but that project also fizzled. A Taiwanese venture failed as well." The company increases the DC-3's volume 35 percent by inserting a 40-inch plug in the fuselage forward of the wing and moving the cabin bulkhead forward five feet. 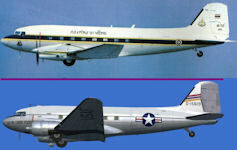 A BT-67 boasts 45 more mph of cruise speed and almost 4,000 more pounds of useful load than the original DC-3. The BT-67 modernization includes a complete airframe overhaul, aerodynamic improvements, structural modifications that increase strength and improve performance, and new systems that improve reliability. All changes are certified through extensive testing to FAR Part 25, the same tough criteria applied to the latest generation of commercial jet liners. The resulting product, the BT-67, defies standard comparison. It is unquestionably the most highly evolved and proven transport system in its class, both in terms of productivity and cost effectiveness. Warren Basler [1926 to 1997] knew that there was a need for a better and more efficient version of this highly reliable aircraft. With this vision, Basler Turbo Conversions was created. Production began in the new 75,000 square foot facility in January, 1990 at Wittman Regional Airport in Oshkosh, Wisconsin. Since that time, BT-67 aircraft have been manufactured and sold to customers from every corner of the world. In 1996, control of the company was assumed by Jack Goodale, an aviation minded entrepreneur from Grand Rapids, Michigan. Mr. Goodale brought his considerable skills and background as a builder of businesses to the company and nurtured and guided the business to its current standing as a complete and focused aircraft manufacturing company. Basler had a concept for reviving an aircraft that operated faithfully in rugged environments throughout the world for many years. The original version of the airplane still flies in many third world air forces and in civilian applications. The military version was the Douglas C-47 Skytrain, used extensively during the Berlin Airlift, and the civilian equivalent, the famous DC-3. Once extremely successful in earlier FID operations and in accessing remote areas, over the years this C-47 became increasingly impossible to maintain for its age and lack of spare parts. For the developing world - also for the underdeveloped - Basler zero-timed Lhe airframe, redesigned the wing, stretched the bulkhead forward 60 inches, overhauled and added new systems, and re-engined with twin Pratt and Whitney PT6A-67R engines and Hartzell five-bladed propellers. 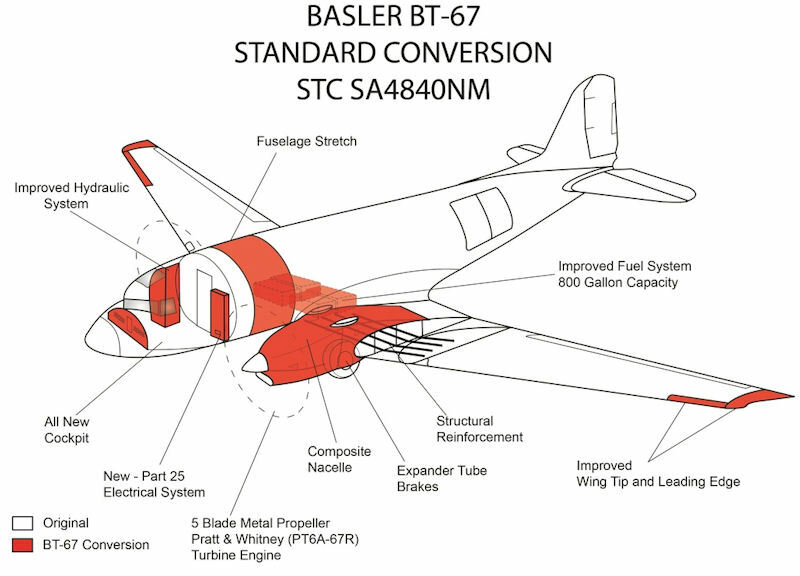 Basler advertises, "the BT-67 provides a 76% increase in productivity at 50% of the original DC-3 operating cost." It does so now as an all-weather-capable aircraft featuring independent systems such as self-start for remote operations. 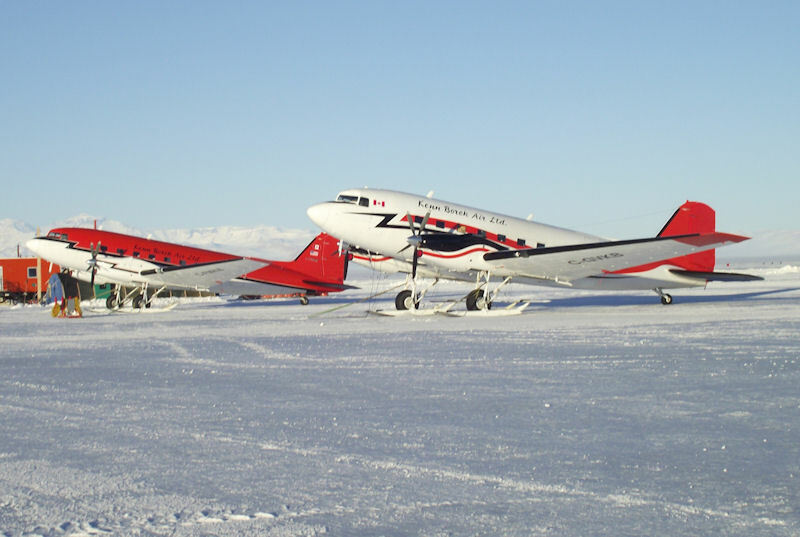 Basler converted the DC-3, keeping unsophisticated capabilities of the old aircraft, and added new technology to ease maintenance, improve airlift, and boost payload. New hydraulic and electrical systems, with widely-available aviation parts behind easy-access service panels, add reliability while simplifying the magnitude of supply and maintenance efforts. The design similarly allows for over-the-wing repairs, eliminating the need for numerous special tools and equipment. A convenience for some uses, these features are necessary for reliable operations from remote areas. Cargo capacity improves with the stretched airframe and more powerful engines. The aircraft loads through a side door and takes cargo intended for rollers, guide rails, or bulk shipment. The military version holds 40 troops or 32 litters, and the civilian equivalent carries 19 passengers comfortably. New aircraft design includes the option for survivability equipment and makes other features standard. Armor shrouds the cockpit and seating areas, and a vent-over-the-wing design shields hot engine exhaust from ground sensors - an engineering aspect that has effectively eliminated IR signature. Further, the new engine and propeller combination permits low noise operations. Using FLIR mounted in the nose or wing, the aircraft can aid day or night reconnaissance and surveillance missions. Also, the provisions for quick-load mission modules could aid intelligence-gathering or PSYOP operations. Valuable beyond airlift, the aircraft operated as an accurate sidefiring gunship in El Salvador. The conversions dramatically increase power, decrease maintenance complications, and improve utility. Also, the guns can be removed, and the aircraft used for airlift missions. Other proven capabilities for the conversion platform are maintenance support activities; medical evacuations; photography; antisubmarine warfare and maritime paol; drug interdiction; remote area delivery and support; parachute operations; command, control, and communications (C3); tug-target tow; and fire fighting. Basler can service its conversion aircraft sales wherever they operate with engine overhaul and heavy maintenance shops worldwide. Basler sold at least 20 of these conversions in South America by the early 1990s. Operators include Colombia (gunship), El Salvador (transport), Guatemala (transport), Mali (transport), Mauritania (surveillance), Thailand (scientific research), and by the US State Department (transport and surveillance), In 2016 Basler Turbo Conversions offered their BT-64 gunship to the Philippines as a replacement for their Rockwell OV-10 Broncos. The 6th Special Operations Squadron (6th SOS) is a combat aviation advisory squadron. Over the years, members of the 6th SOS have taught foreign militaries in a variety of aircraft to include the Russian Mi-8 and Mi-17 helicopters, the Spanish CASA 212 transport, the Cessna 208, the Beech King Air 350, the French AS-332 Super Puma, the Canadian DHC-6 Twin Otter, the Basler BT-67, all models of the US Huey helicopter and several USAF C-130 variants. The Naval Oceanographic Office (NAVO) acquired a new Basler BT-67 survey aircraft (a turbine DC-3) for the NAVO Airborne Coastal Surveys program in 2013. The airplane has been outfitted with the new Coastal Zone Mapping and Imaging Lidar (CZMIL) system to enhance the reach and capabilities of the Airborne Coastal Systems program. It will allow NAVO to collect data more efficiently and in more remote locations. The BT-67 (tail number C-FBKB) is a reconstructed 1943 DC-3 with enhanced 12-hr endurance and payload capability allowing the airplane to mobilize to survey locations carrying the sensors, data processing equipment, and spare parts. It improves on the original high efficiency design of the DC-3 with modern enhancements that were installed during a 10-month reconstruction in Oshkosh, Wis. The aircraft, after being outfitted with a CZMIL system, was tested in June 2013. C-FBKB deployed to Ft. Lauderdale, Fla., to conduct a safety of navigation hydrographic survey mission on the Bahama Bank in support of NORTHCOM and NGA charting requirements. The Naval Oceanographic Office (NAVO) BT-67 is a retrofitted DC-3 airframe, designed in 1939 and built in 1943. This plane has no autopilot, no fly-by-wire or hydraulics, it's all cable controlled. There's no denying the twin-engine turboprop is a classic, but it's what's going on inside the 70-year-old aircraft that makes these flights truly significant. Inside the cargo area of the airplane resides a cluster of technological equipment, all designed to be used to perform an airborne coast survey. The lynchpin of this survey is the Coastal Zone Mapping and Imaging Lidar (CZMIL) system. According to the NAVOCEANO, the CZMIL is an airborne coastal zone mapping system that produces high-resolution 3D data and imagery of the beach and shallow seafloor down to approximately 50 meters. Critical to this data gathering operation is the BT-67 itself. In the past other aircraft had been used for the airborne coast survey operation, however, there was a need for longer endurance capability. Each mission requires the aircraft to fly up to eight hours back and forth in lines over the ocean while the Lidar system maps 'strips' of the ocean floor that will be pieced together in final data processing.